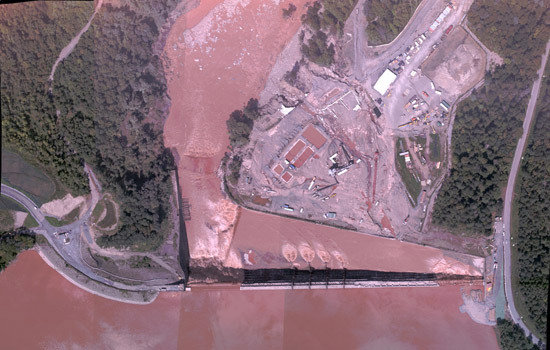 RIT captured high-resolution color imagery of water overflowing the Gilboa Dam on Aug. 30. Several images were stitched together and provided to New York State Office of Emergency Management within four hours. Researchers at RIT and University at Buffalo are presenting a workshop May 30–June 1 on improving disaster response with remotely collected data. A bird’s eye view of disasters gives emergency responders information that could help assess critical situations. Researchers at Rochester Institute of Technology and University at Buffalo are presenting a workshop on improving disaster response with remotely collected data. The 2012 Joint Workshop on Disaster Response will be held May 30–June 1 at RIT’s Chester F. Carlson Center for Imaging Science Auditorium, with an on-site training workshop at RIT and a field visit hosted by the UB Center for Geohazards Studies. The RIT Information Products Laboratory for Emergency Response and the UB Center for Geohazards Studies will share advances in remote sensing technologies used to create “information maps” that can assess damage to buildings and infrastructure, detect toxic plumes in water or conduct land-cover analysis to identify crops contaminated by radiation, such as in the aftermath of the nuclear disaster at Tokyo Electric Power Company’s Fukushima Daiichi. The free event is sponsored by the National Science Foundation Partnerships for Innovation, RIT Digital Imaging and Remote Sensing Laboratory in the Chester F. Carlson Center for Imaging Science, and the UB Center for Geohazards Studies. The workshop will bring together members of the emergency management community, representatives from the remote-sensing industry, and researchers studying geohazard phenomenology and advancing remote-sensing technology to identify needs of the emergency response community and corresponding product development. Featured speakers from federal agencies and the commercial sector include Brenda Jones, disaster response coordinator from the U.S. Geologic Survey; Matthew Pritchard, professor of earth and atmospheric sciences at Cornell University; Ron Eguchi, president and CEO of ImageCat Inc., and Shay Har-Noy, CEO of Tomnod Inc. The event will consist of roundtable discussions, student presentations and updates on the Information Products Laboratory for Emergency Response’s support in 2011 in the aftermath of the earthquake and tsunami that hit Japan and during flooding in New York state following Hurricane Irene and Tropical Storm Lee. A real-time demonstration will be held of an airborne remote-sensing system, image collection, processing and dissemination, weather permitting. For more information and to register, go to http://ipler.cis.rit.edu/workshop or contact Don McKeown at mckeown@cis.rit.edu.